An ultra-premium church WordPress theme with real-time homepage builder. Saved is a professionally designed church WordPress theme for making an incredible church website. With its bold design and super easy customization, Saved helps you create a website that reflects your church’s personality. But looks are not all it offers. Utilizing our Church Content plugin (included), you get powerful publishing for sermons, events, staff profiles and locations. 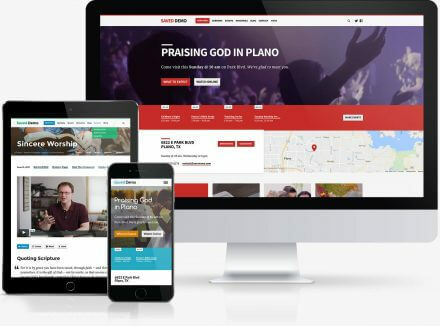 Add to that custom pages, ministries, testimonials, galleries, blog and support for forms, newsletter sign-up and online giving — and you have a complete church website solution. You can use any widget on Saved’s homepage. The possibilities for your church’s homepage are virtually unlimited. You can even show a video background in your intro section. Don’t want to? No problem, use an image or solid color. Everything on the homepage is optional and easy to customize. Other features of this church WordPress theme include a sticky menu that stays visible while scrolling, custom fonts and colors, logo upload, social media icons, multiple church-centric widgets, multi-level menus and a mobile-friendly responsive design. You also get access to our support team and guides with videos. Just get in touch if ever you have questions. We’ve helped thousands of churches and will help you too. The Church Content plugin is included with Saved. You also get access to all of our other church WordPress themes, guides with videos, helpful support and starter website content. A design that is smart in that it auto-adjusts itself around your content to always look professional. Saved has a responsive design that auto-adapts to all smartphone and tablet screens. A mobile menu is included. Upload your church's logo image or enter text and choose a custom font. Point and click to change your church website's colors for a custom look. Choose from a hand-picked selection of Google Fonts ideal for Saved. Highlight an important menu item like "New Here" by making it a colored button. Sermon, event and other post archives use an elegant grid of summary cards. "Wow" visitors with subtle animation effects while scrolling down the homepage. Easy to disable if desired. Show images for specific sections (e.g. one for sermons, another for events). Optionally provide a default image. The footer menu accommodates a second level of links for convenient navigation. Saved is optimized for high resolution screens, including Retina®. Drag and drop any widget to create a custom homepage while watching a live preview. Optional video background. Share personal testimonies with the Child Pages template. It's easy to publish written or video testimonies. Publish articles or news on your church's blog. Have one or multiple authors. Nothing beats a WordPress blog. Saved fully supports WordPress 5.0 and its new block-based Gutenberg editor. Includes widgets for sermons, events, locations, people, photos, giving and more. Make it easy for newcomers to find your church with a map in the footer. Get started fast by importing starter content similar to the demo. WordPress and Saved are made for regular people — design skill not needed. A guide is included to help you translate Saved into another language.